28 The Sublimation Report • Spring 2019 a-e-mag.com • printwearmag.com decorator to deliver high quality with a minimal investment. DIGITAL NOW COMPETITIVE WITH OFFSET Traditional offset dye-sub printing has moved from offset printing presses to inkjet. The reason for this is apparel manufacturers are limiting the size of their runs, and the combined cost per square foot of ink and media has decreased substantially over the past several years. There are a number of apparel compa- nies with printer farms — as many as 100 printers — printing day and night who then ship rolls of printed paper offshore for production. The final finished garments are then returned to the U.S. and sold via the retail market. NEW WORKFLOWS We are starting to see dye-sublimation decorators, whether it be in soft signage, apparel, or other applications, move their entire operation to an online presence. The challenge for moving to online opera- tions has been that software has not kept pace with the requirements. Generally, the RIP software does not talk to inventory software, does not work with production software, and cannot accept data from the web. But this is quickly changing with a number of companies such as Wasatch and Caldera, who are moving to new types of RIP workflows to enhance the overall operations of dye-sub providers. TOTAL SOLUTIONS FROM ONE SOURCE In the past, producers in the graphics industry may have purchased their printer and ink from one supplier, heat press or calendar from another, and profiling equipment from another, with the chal- lenge being ensuring that everything works properly together. Tukatech, a provider of apparel CAD software, is now offering a complete apparel solution from imaging a person's body in 3-D, printing an adjusted template of a garment, doing the transfers to the fabric, cutting out the garment using laser cutting, and then finally sewing the garment together. This all occurs in the matter of one hour. This is just one example of how retailers can now find all of their sublimation solutions from one source. NEON COLORS Sports apparel manufacturers are requesting ink sets with far wider color gamut than in the past. Current sets of only cyan, magenta, yellow, and black are not sufficient to achieve the color gamut which some apparel manufacturers require, and which many end-users (i.e. your customer) desire. Adding neon yellow, neon red, and neon orange greatly increases the color capability and offering. Plus, it's what the customer is after. HIGHER-QUALITY INKS With the maturation of the dye-sub market, shop owners have become far more demanding as it relates to the per- formance of the inks. It is expected that an ink will not cause print head clogs, will have a shelf life of 18 months, will have a complete range of colors including neon, and have much-improved light fastness. 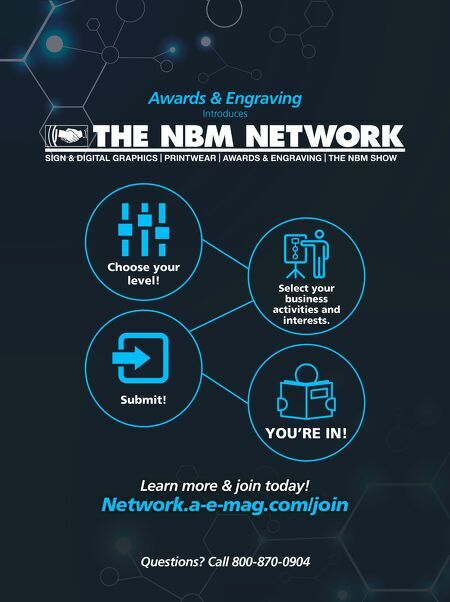 NEW MARKETS The dye-sub market has recently been comprised of soft signage, apparel, pro- motional items, and related personalized products such as gifts and awards. There is a great deal of opportunity opening up with technical fabrics traditionally not associated with sublimation, and in the home décor segment. In both cases, the markets are much newer, so for those who choose to participate in this segment, the competition will be less pronounced. Hopefully briefly touching on these trends helps you as you build your dye- sublimation business. 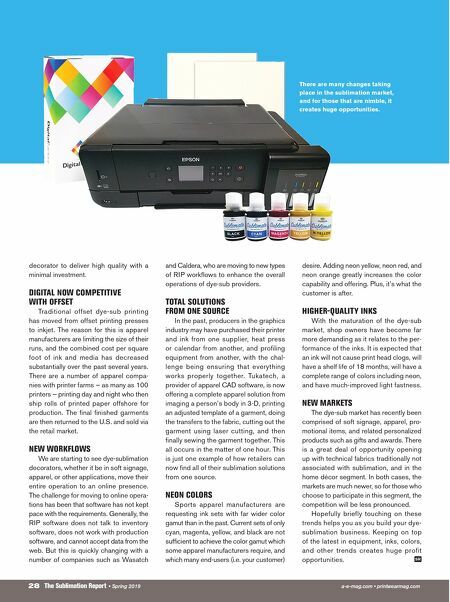 Keeping on top of the latest in equipment, inks, colors, and other trends creates huge profit opportunities. SR There are many changes taking place in the sublimation market, and for those that are nimble, it creates huge opportunities.